Brushable and flexible quartz polymer mortar for increased waterproofing and strengthening requirements. 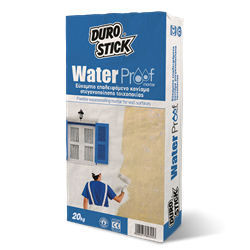 Protects any wall surface from any rain related moisture penetration. Apply it on plaster wall surfaces exhibiting moisture problems, resulting in their disintegration, flaking and the formation of hairline/capillary cracks (common problems that occur often). Apply it also on concrete wall surfaces to protect them from carbonation. When applied, the product creates stable and waterproof substrates for the finishing decorative paint. Classified as product for surface protection of concrete surfaces per EN 1504-2.